Five fatally shot in a shopping mall North of Seattle. 2. Venus ruler Mars quintile Neptune. 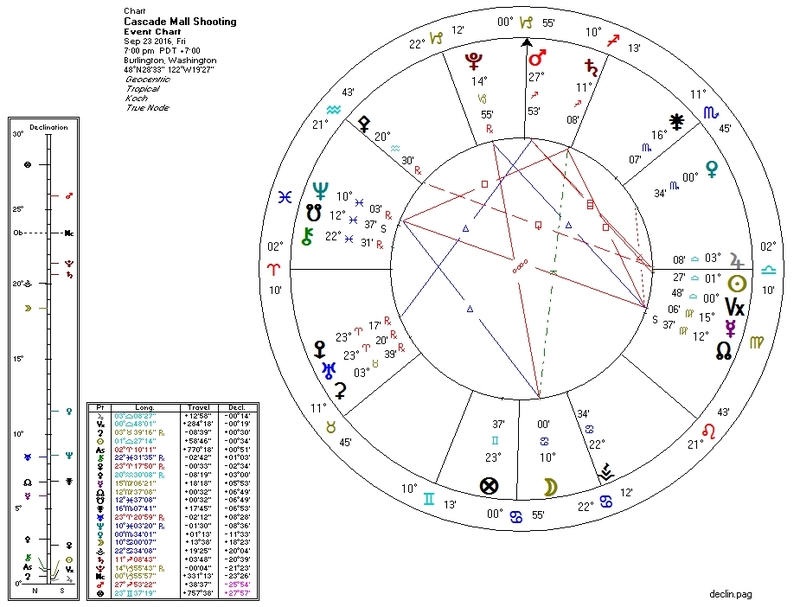 Transiting Pluto at 14 Capricorn is trine Pallas on the Burlington WA incorporation chart at 17 Taurus. This is not an accident. Transiting Pluto will almost definitely be in aspect to the natal and/or progressed Pallas on the killer's chart. 1. Allow potential victims to be legally armed and shoot back at attackers. 2. Allow the victims of mass violence to sue drug companies for damage inflicted by persons on violence-inducing psychiatric medication. 3. Communities and law-enforcement should adopt a zero-tolerance policy for persons openly calling for murder. The imam in Florida who called for the murder of gays prior to the Orlando massacre, and numerous persons associated with Black Lives Matter should be persona non grata in all American communities. The organizations with which these persons are affiliated should be similarly unwelcome unless they explicitly denounce their violent radical elements.